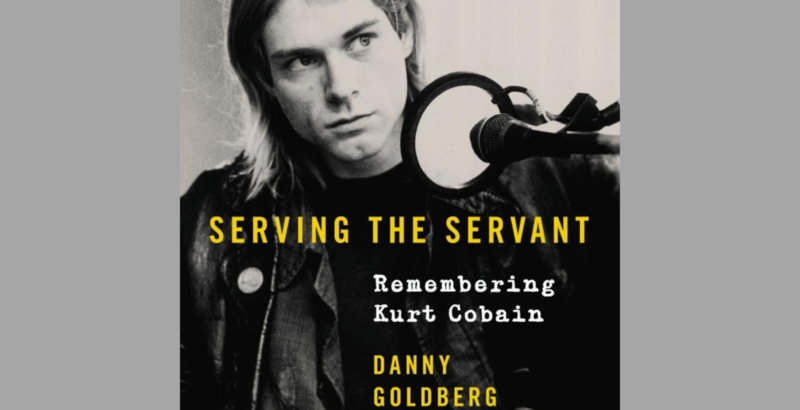 Book Review: Serving The Servant: Remembering Kurt Cobain By Danny Goldberg - GENRE IS DEAD! Since his death, Kurt Cobain has become a mythological figure due to his large impact on music and untimely death. With the countless books, movies, and documentaries about him, it’s hard to know what he was really like. His penchant for lying in interviews makes this even harder. Former Nirvana manager Danny Goldberg draws on his own memories, along with interviews from Cobain’s family, friends, bandmates, and peers to show us the man he knew in the new book Serving the Servant: Remembering Kurt Cobain. Whereas other Cobain books read like depressing eulogies panting the rocker as a tragic figure, Goldberg’s book is a celebration of his life. He recounts Nirvana’s meteoric rise to fame with pride and gushes about Cobain’s talent and art like a proud father. Along with retelling the band’s biggest moments, like their Unplugged performance and the making of the “Smells Like Teen Spirit” video, he also shares rare moments unknown to fans, like how much Cobain worried about finances, him obsessively watching MTV seeing how often Nirvana’s videos were played, and his struggle to maintain indie cred while reaching the masses. He addresses the many sides of Cobain, depicting the rocker in a new light. Goldberg didn’t know Cobain as a tortured soul. Instead, he shows us the person he knew by giving us a rare glimpse of his other sides, like the savvy businessman, the activist supporting LGBTQ and Women’s rights, and the passionate family man. Instead of talking about his gloomy side, he talks about how nice he was to whomever he worked with, from record executives to promoters. He fondly remembers Cobain as sweet and humorous; someone who liked to crack jokes and play pranks. But Goldberg admits he had a dark side, which could strike at any moment. He describes moments where Cobain is a “control freak” and a “man child” if he didn’t get his way. Even bassist Krist Novoselic says Cobain could be “mean and vicious.” These comments aren’t meant to portray Cobain as a bad person. Rather, it grounds him showing he was human just like the rest of us. We also get a rare glimpse at Cobain’s vulnerable side. Goldberg speaks about the mounting pressure he faced to keep Nirvana popular, write a successful follow up to Nevermind, and the aftermath of the infamous Vanity Fair piece. Considering how guarded he remained in the press, we had little to no idea the battles Cobain felt he was facing on his own. He tried to keep it together, but Goldberg reveals how the pressure affected him when the cameras were off leading to erratic mood swings and increased drug use. Reading about this tumultuous time helps us see why Cobain felt heroin gave him a moment of peace. The final chapters discuss the last time Goldberg spoke to Cobain after a failed intervention and his tragic death. He even talks about the funeral, the chaotic aftermath of his death, and murder conspiracy theory, which he dismisses. The way Goldberg questions what more he could’ve done, it’s clear that 25 years later Cobain’s death remains a harrowing moment for him. And like others who knew him, his untimely passing still shocks and saddens him to this day. Yet, the book ends on a positive note as Goldberg looks back on Nirvana and Cobain’s effect on music and how their contributions can still be felt to this day. He expresses gratitude for having the chance to spend time with him and seeing his legacy live on. Serving the Servant is a loving tribute to Cobain that attempts to separate the man from the myth. It’s an honest account of Goldberg’s limited time with the artist written out of love and great respect. This book does what most Nirvana books fail to do; give us something new. Most books do nothing but rehash the same Nirvana stories and theories. Reading about the many aspects of Cobain is fascinating and helps us understand the rocker a bit more. It’s clear Goldberg is proud of the time he spent with Cobain and instead of telling a tragic tale, he celebrates Cobain’s life, his legacy, and the gift he shared with the world. Serving the Servant: Remembering Kurt Cobain is out April 2 viaEcco. Pingback:Book Review: Heavier Than Heaven By Charles R. Cross - GENRE IS DEAD!